I recently did a Cherry Culture haul, and I'll put it on record it's probably one of the best hauls I've ever done! I always have seen nail polish on Cherry Culture, but I always held back from purchasing because majority of the polishes I could never find swatches of. I then saw this haul from Bonny Binnacle, and it pushed me over the edge. I'm going to take a risk! I ended up ordering 11 polishes, 9 NYX and 2 Sinful Colors. I was able to see a few swatches, but I'd say 8 out of the 11 of these I relied on the swatches on the website, which is never a good guide. When I got my package yesterday, I was over the moon! I also went ahead and made some mini moo cards for my blog. These are small sized business cards. I learned about these through The PolishAholic & Once Bitten. You can really be creative and customize these cards to your liking. On the other hand, if you're not in the creative spirit , you can go a very simple route. They have a lot of templates you can choose from, fonts,colors and etc. This is what I did. I know these are probably a little yawn-worthy to some, but I like the simple right now! I only got a 100 cards to start, so maybe later on I'll create some more exciting ones. great haul! I'm looking forward to seeing swatches of your NYX purchases, I want to pick up more of their stuff but swatches are fe and far between! Your Moo cards turned out great too! I love the back! Can't wait to see some swatches, especially for those Sinful Colors. I ordered some MOO cards, too. Those are so cute! and what would you use Moo cards for?? I too am looking forward to the NYX swatches! :)Glittery!! you win at hauling. What lovely polishes! Really nice haul!! 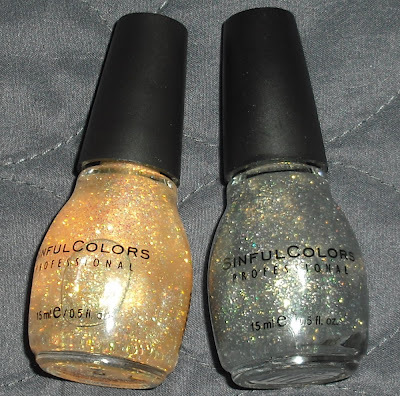 I'm wanting those sinfulcolor glitters. I haven't seen these. 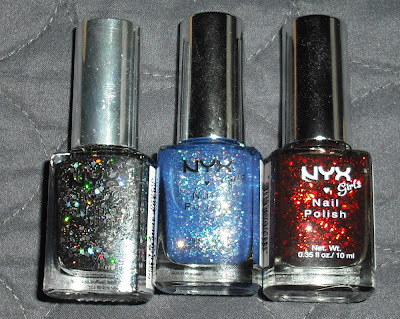 Now I need to buy more stuff... Was thinking about getting some of the new LA Girl Glitter Addicts as well, but I haven't seen swatches yet! Ya Gotta- Thanks! I hope you like your Moo cards! Forever 92'- Thanks. They're kind of like business cards. I plan to include them with swap packages and giveaways. 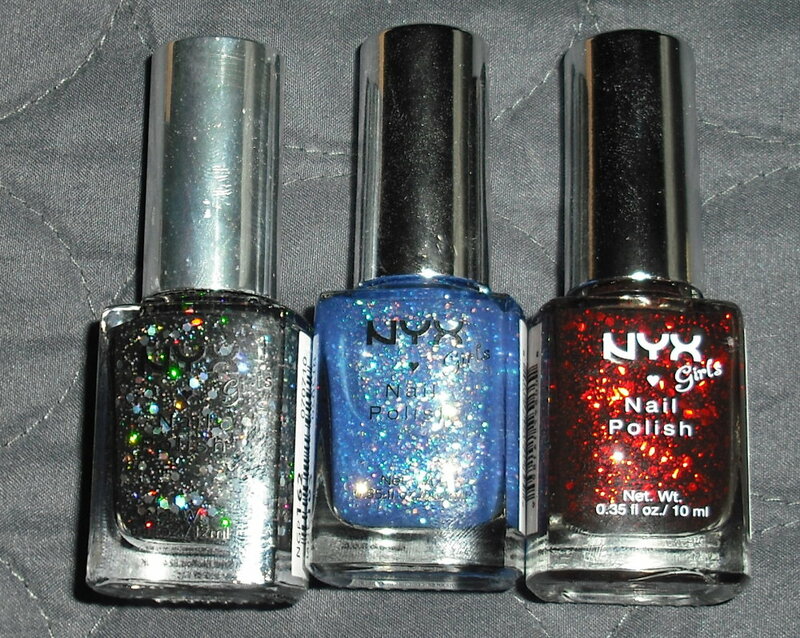 Also, if I run into someone who has an interest in polish I can hand them out to them. Ash-Oh no I'm sorry! I hope you can find some soon. I wish when I was visiting the UK I was into nail polish! I missed out on some neat brands! Lesley- Haha, I actually think I did "win" this time around. Thanks! 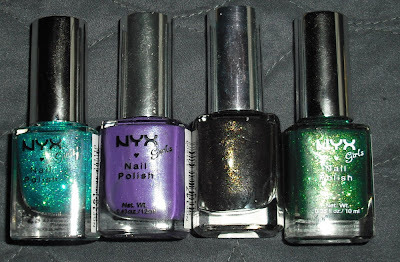 NiftyBa- I know it's difficult to buy stuff without swatches it could really go either way. Is Suede Shoes a new shade or an older one? I don't remember seeing it before--I like it!